Making rope and twine, and the associated trades of manufacturing webbing and sacking, was established centuries ago in Yeovil and continued into the twentieth century. Common natural fibres used in rope making were manila hemp, hemp, linen, cotton, coir, jute, straw, and sisal. As early as 1587 the Woborn Muniments recorded William Beacham as a Sackwever at the Dye House and in 1622 the Muniments recorded John Beacham, presumably William's son, continuing as a Sack Weaver at the Dye House. A deed dated 1678 recorded John Jacob as a Roper and a similar deed dated 1705 recorded John Newman as a Roper. The Yeovil Poll Book of 1733 listed William Nail (Neal) as a Roper of Wigdon & Huntley (today's Yeovil Marsh) and, according to their accounts, the Churchwardens bought ropes from William Neal, described as a Roper, in 1790. This was presumably the son of the William of Wigdon & Huntley. This same year of 1790 William was listed as a Roper in the Universal British Directory. This crest appears on a memorial on the east wall of the south transept of St John's church, to John Neal who died in 1847, aged 65. There is also a memorial window in the church to William Neal, who died in 1834 aged 62 and is believed to be John's father. 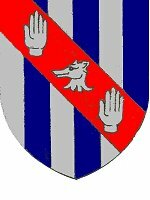 The arms were paly of six argent and azure, on a bend gules, a greyhound's head erased between two dexter hands couped at the wrist argent (on a field of silver and blue divided perpendicularly, a diagonal red stripe with a silver greyhound's head, violently torn off, between two silver left hands cut straight across the wrist). 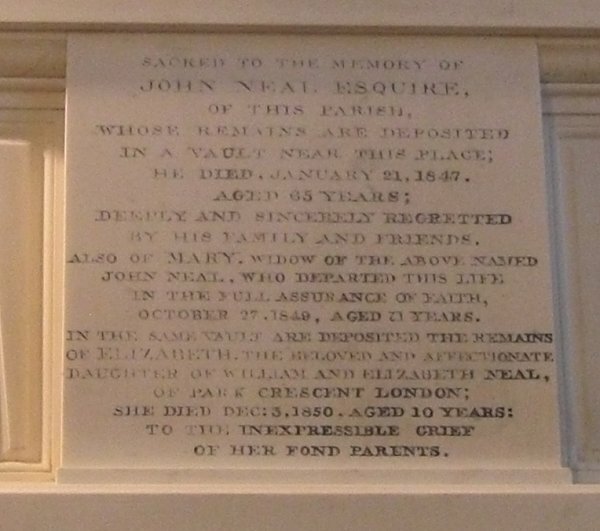 John Neal was born around 1778 and is recorded as supplying ropes to St John's church, from 1805 until 1836. John Neal is referred to in the Churchwarden's Accounts variously as a Rope Maker, Rope Manufacturer and Rope Supplier. He also served as a Churchwarden himself in 1811, 1812 and 1816. He was recorded as a Sack, Sacking & Twine Manufacturer in Pigot's 1824 Directory and as a Sacking Manufacturer in Pigot's Directory of 1830. 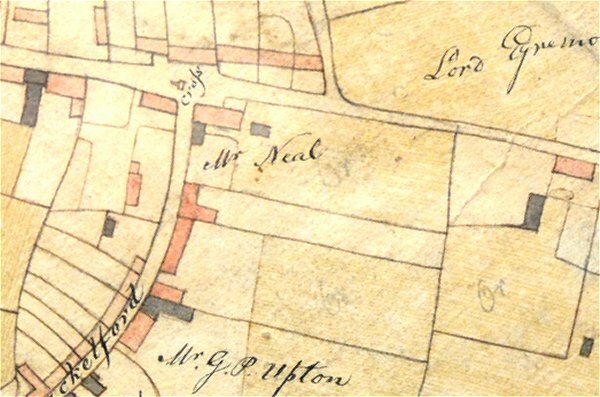 Neal's rope works were in Reckleford on the south side of today's Reckleford, opposite Goldcroft, and his property is shown on Watts' map of 1806 below at which time the rope-walk was presumably of the open air type. By the time of Watt’s later map of 1831 (also seen below) a covered rope-walk is shown running parallel to Reckleford with what looks like a second covered rope-walk at right angles as well as other associated buildings. John Neal was listed in the Poll Books of 1832, 1834 and 1846 by virtue of owning the freehold house in Reckleford in which he lived. William and his wife Mary had at least three children; William the son and heir and two daughters - Elizabeth and Mary Ann. Mary Ann was to become the wife of Frederick Greenham who, with William Neal, was John's executor. Frederick and Mary Ann lived in Hendford House (today's Manor Hotel). In the 1841 census John Neale, by now aged 63, was living with his wife Mary, aged 63, in Rotten Row (today's Market Street) although since his property was on the corner of both Reckleford and Market Street he probably was still in the same house. John listed his occupation as being of independent means. John Neal died at the beginning of 1847 and his will, dated 1844, was proved in London on 15 February 1847. A rope-walk was a long straight narrow lane or a covered pathway, where long strands of material were laid before being twisted into rope. Ropewalks historically were harsh sweatshops, and frequently caught on fire, as hemp dust forms an explosive mixture. 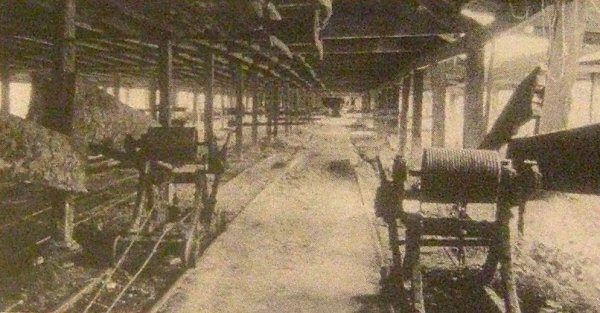 In 1848 John Neal's rope factory was destroyed by fire. The site of the rope works was built on by William Tucker in the 1890s and became Salisbury Terrace. 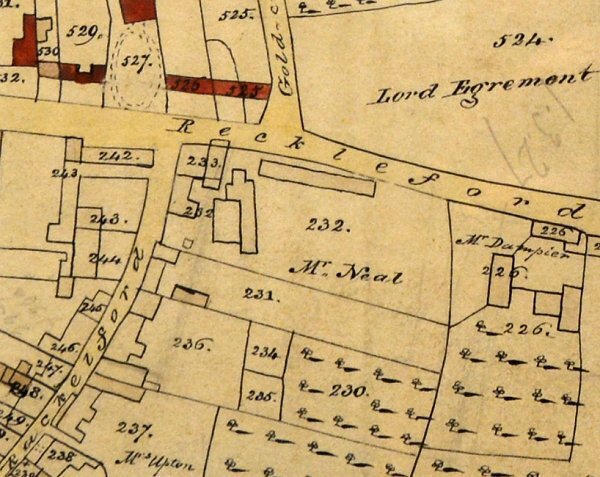 E Watts' map of 1806 shows Reckleford running across the top while Rackleford (today's market Street) runs from it down to the bottom left corner. The large corner site annotated 'Mr Neal' at this time referred to John Neal, the son of William Neal. E Watts' later map of 1831 shows that, by this time, John Neal had constructed a covered rope-walk running parallel to Reckleford (most likely replacing an earlier open-air rope-walk) with possibly a second rope-walk and other associated buildings at right angles to it. 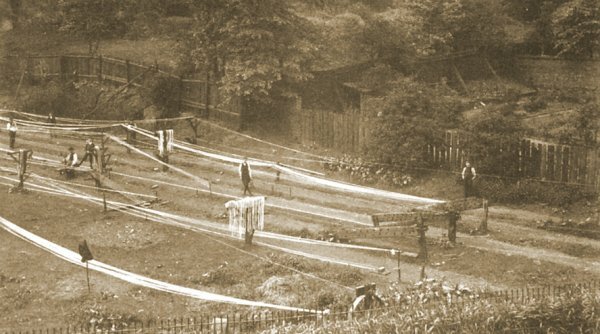 Although not in Yeovil, this photograph dates to around 1900 and illustrates a typical open air rope walk. An illustration of a covered ropewalk - actually Dawe's ropewalk, West Coker. Photographed around 1980. 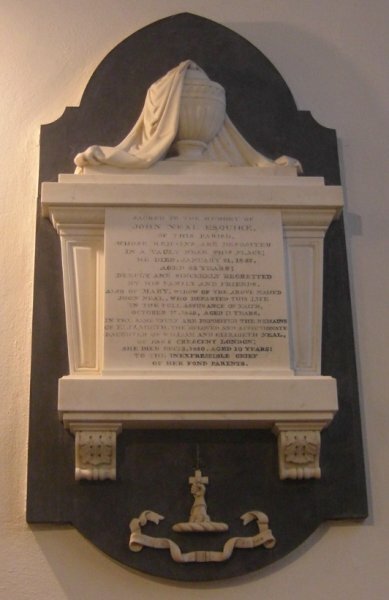 The memorial to John Neal in St John's church. The inscription of the above memorial.